Not only is November light beautiful at the beach in the afternoon, it looks pretty good inside my studio, too. 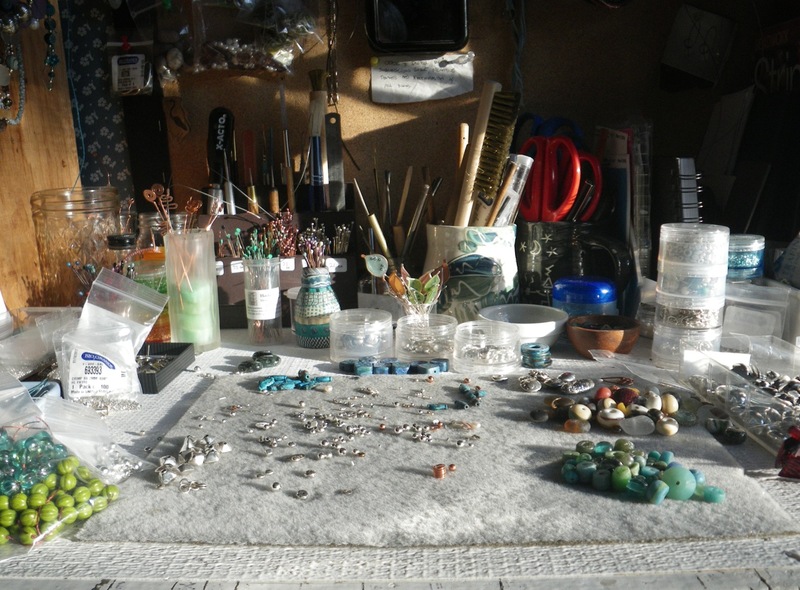 Just look at the shadows cast by tiny beads on my bench, calling me to sit down, be creative, and enjoy. And that’s just what I’ve been doing. Enjoying my work. Making that final push before the holidays and feeling more energized by the deadlines than frazzled. I don’t know if I will still feel this way after Thanksgiving, but for now, I’ll take it. *Can not be combined with any other discounts or sales. 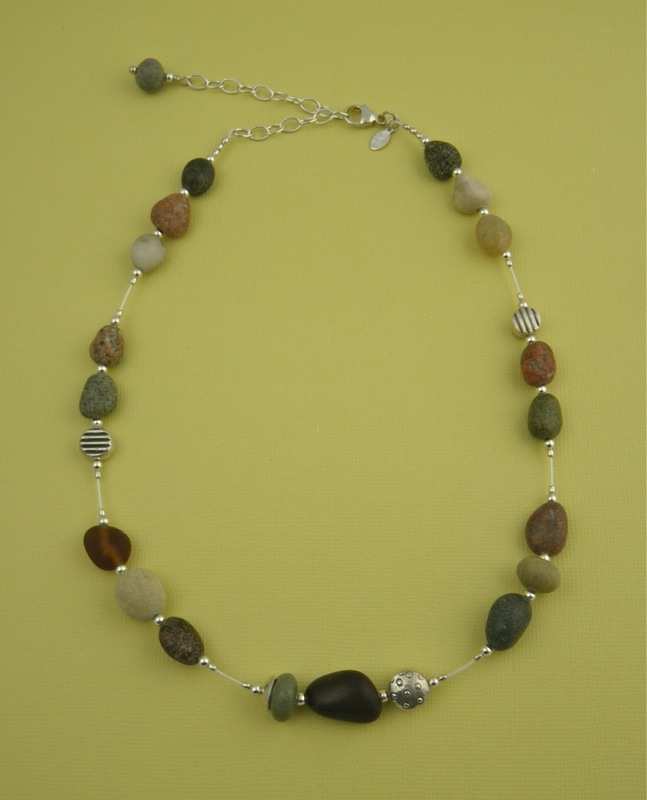 Come support the Center for Maine Craft and its over 300 current artists with work on display. Put your name in a RAFFLE for a Center Gift Certificate! Also, don’t forget a purchase receipt gives you a discount coupon for local businesses in downtown Gardiner! A double benefit for going small and going local! If you are traveling up or down interstate 95 or 295 in Maine after Thanksgiving, this stop is right on your way. It’s the only place I know of where you can get gas for your car, pee, get something to eat, and shop for some great craft work made by my fellow Maine artisans. Sounds like a wacky combination, but it’s really a great idea, and it’s a beautiful gallery. I photographed the work I sent, but after it was in the mail and I checked my photos, I questioned the backgrounds I used in my haste to get to the Post Office before the mail went out at 11 a.m. 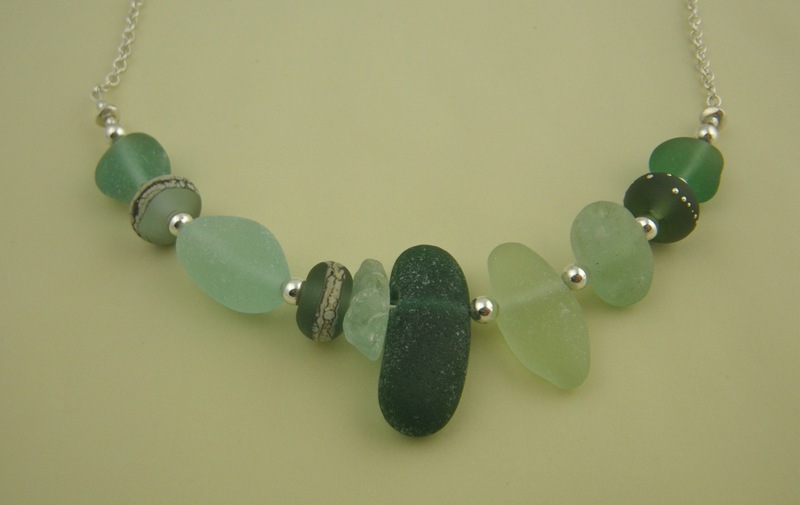 This combination of sea glass and beach rocks also includes some of Sue Kennedy‘s beads. 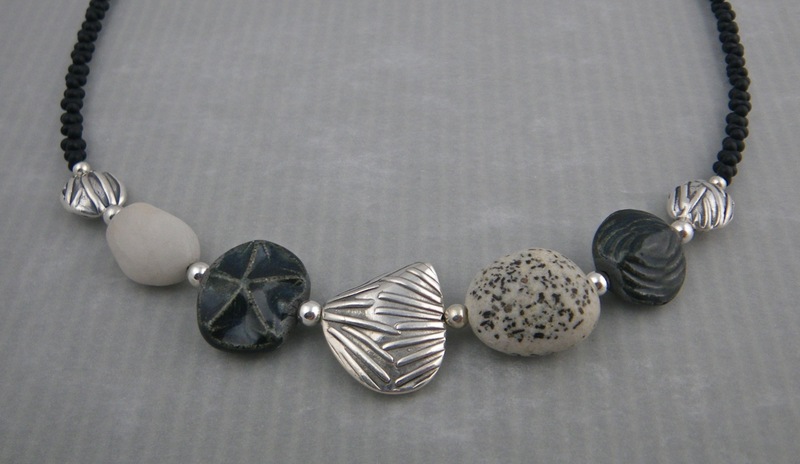 I really love the way her etched beads compliment the rough sea glass. 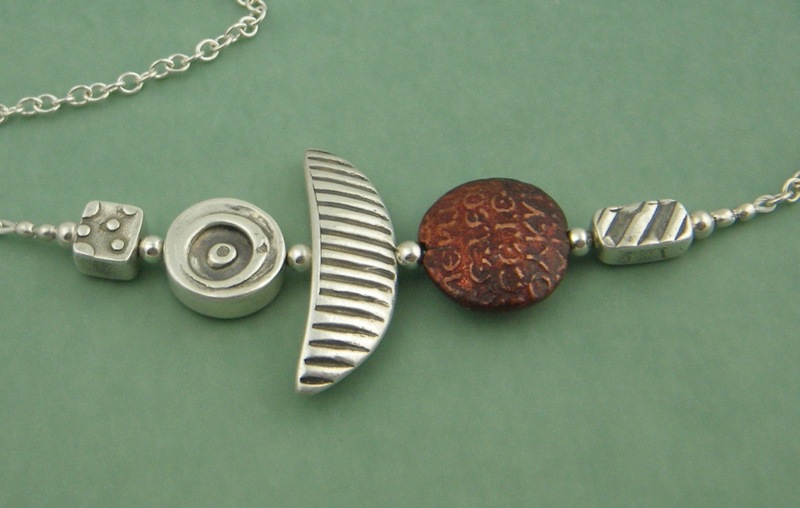 (If you want any of Sue’s shiny beads etched, you can just ask her and she’ll be happy to do it for you.) Can you spot them below? There’s a sweet disc with frit (bumps of glass) along the edge on the right side of the photo. 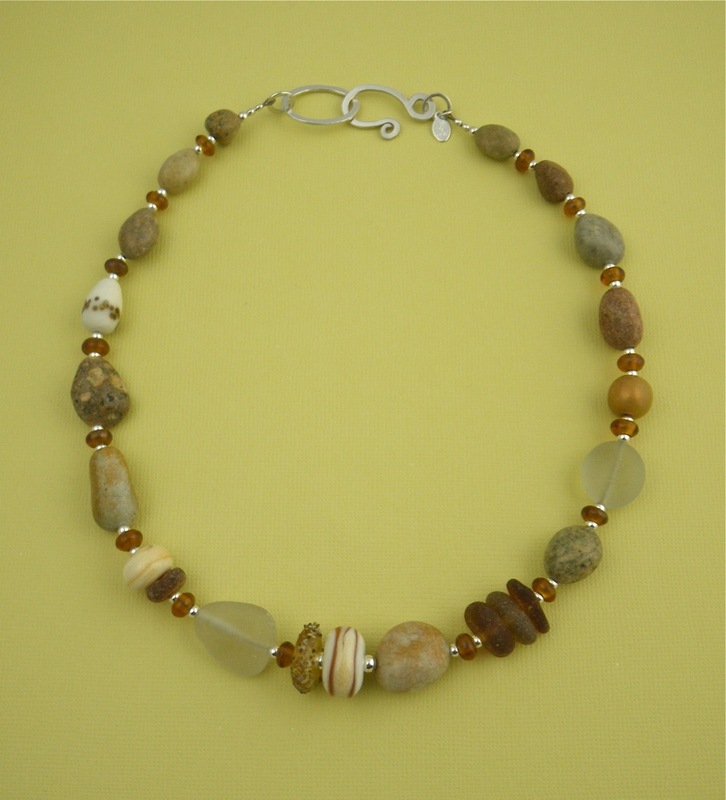 (It’s right next to a cream and caramel colored bead that I actually made myself in a class 2 years ago. 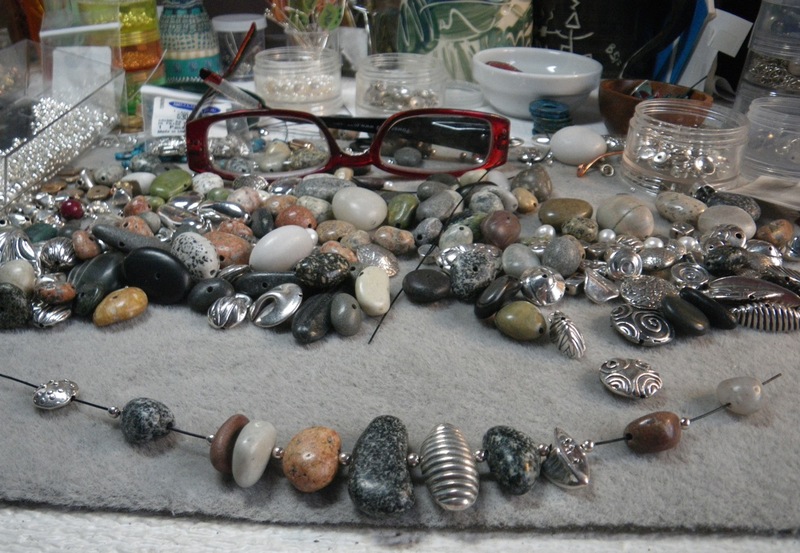 Yes, I wish I had the time and set up to delve into glass bead making, but it’s not to be right now. 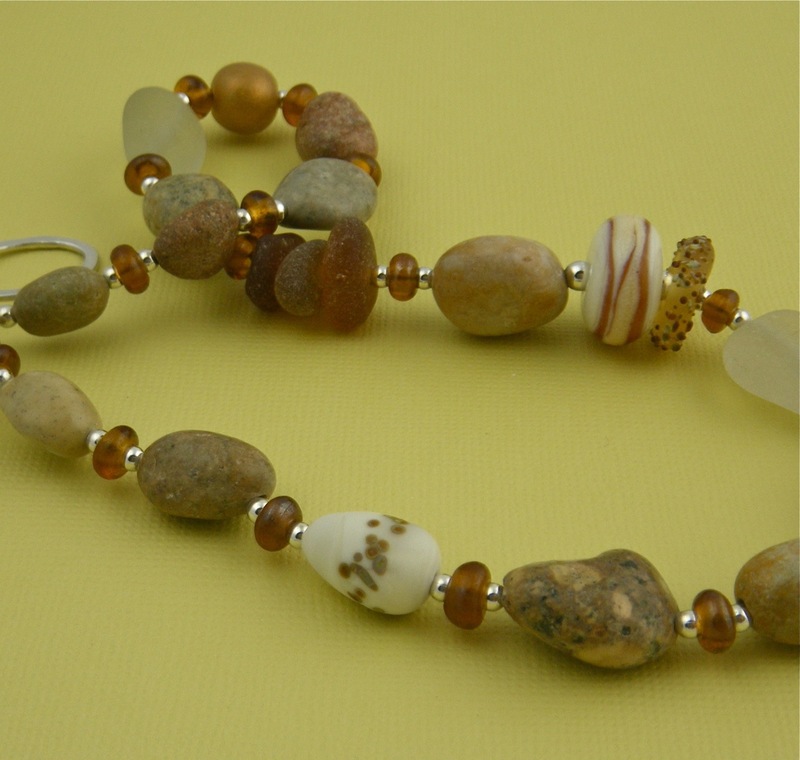 Good thing Sue makes such beautiful beads!) 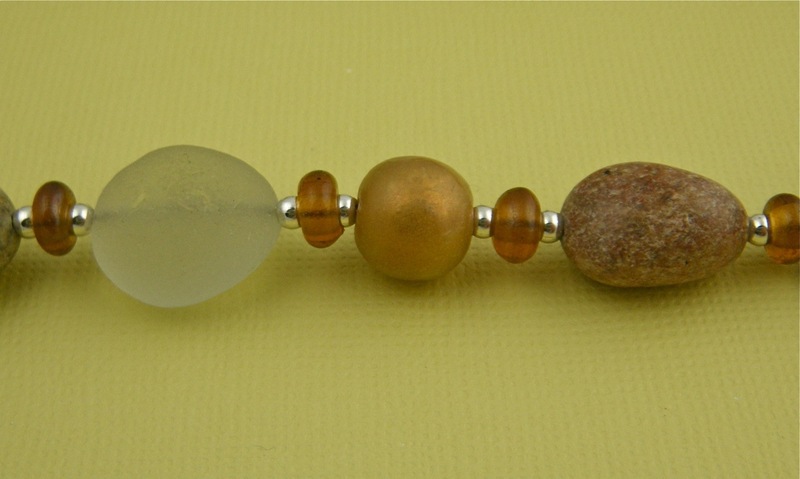 The white egg shaped bead with the dots is also one of Sue’s. 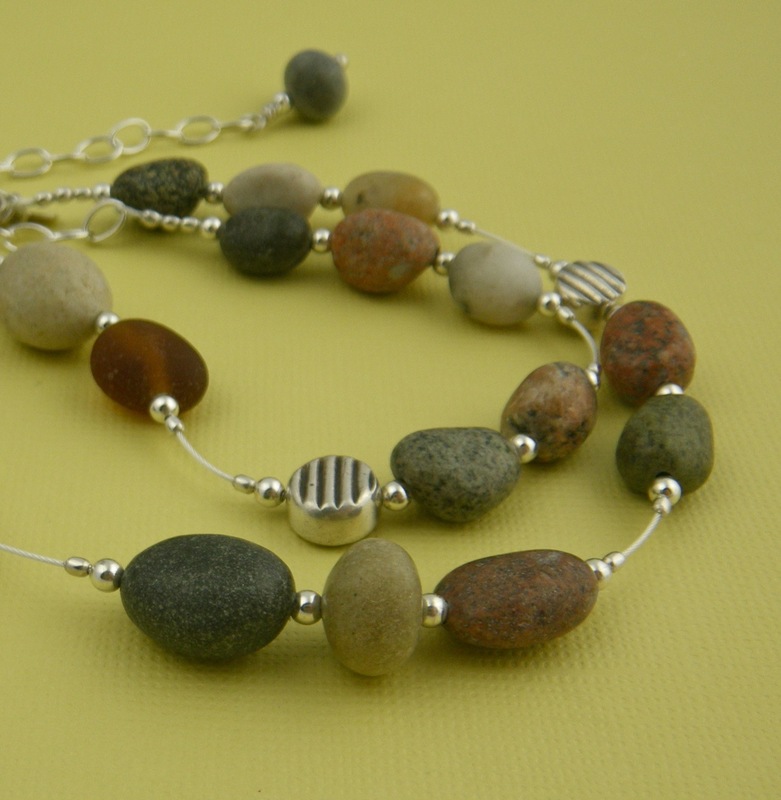 That is sterling silver-plated Beadalon cable between the pebbles. Oy! Time to leave this nasty background color behind. What was I thinking?? 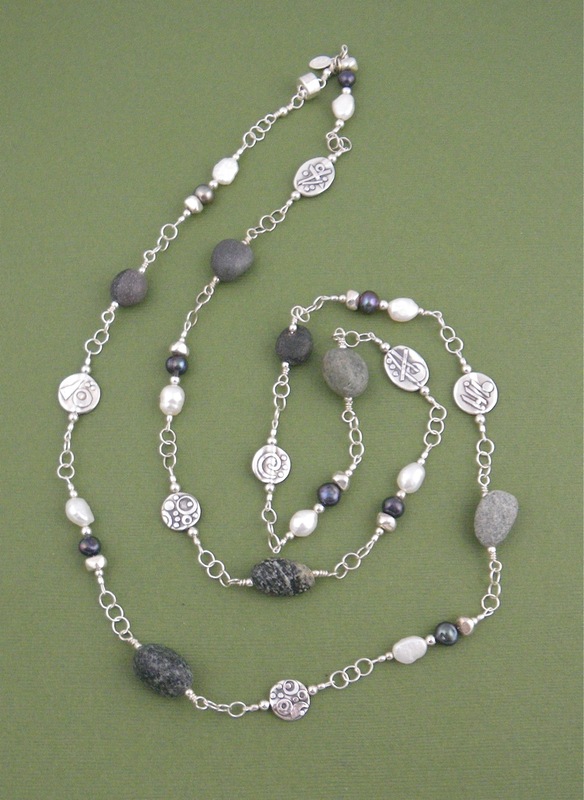 Here’s a longer (37″) necklace combining the beach stones, some sterling chain, freshwater pearls, and some flat disc fine silver beads I made. When I have all my beads spread out in a mess on my workbench, I sometimes see combinations that would not have occurred to me. 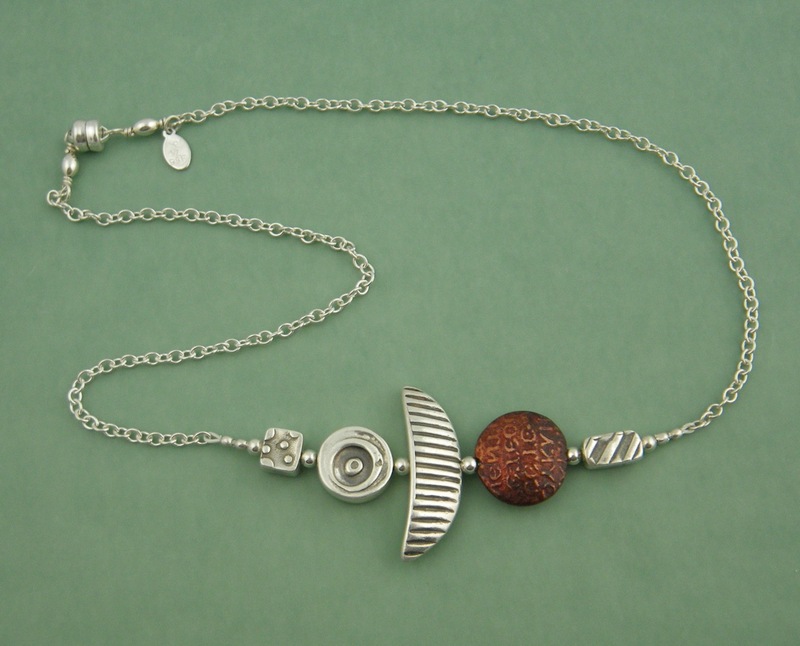 Here are fine silver PMC beads with a copper clay bead that I have patina-ted. 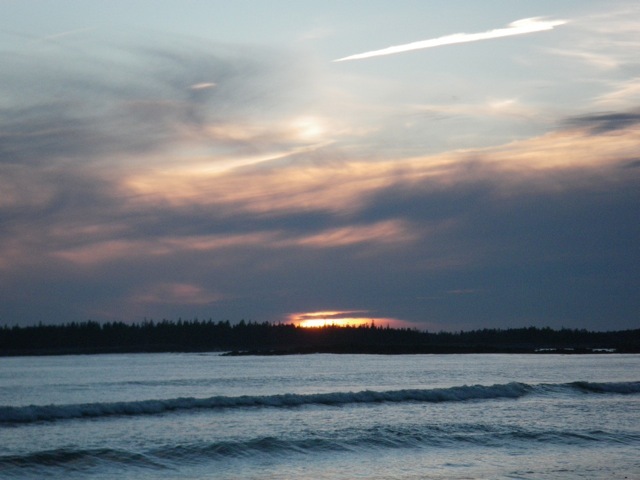 I’m ready to go back to work in the studio after a walk with my sweetie. I have a show on the last day of November and the first of December in Bar Harbor, and another show on December 10 in Boston. 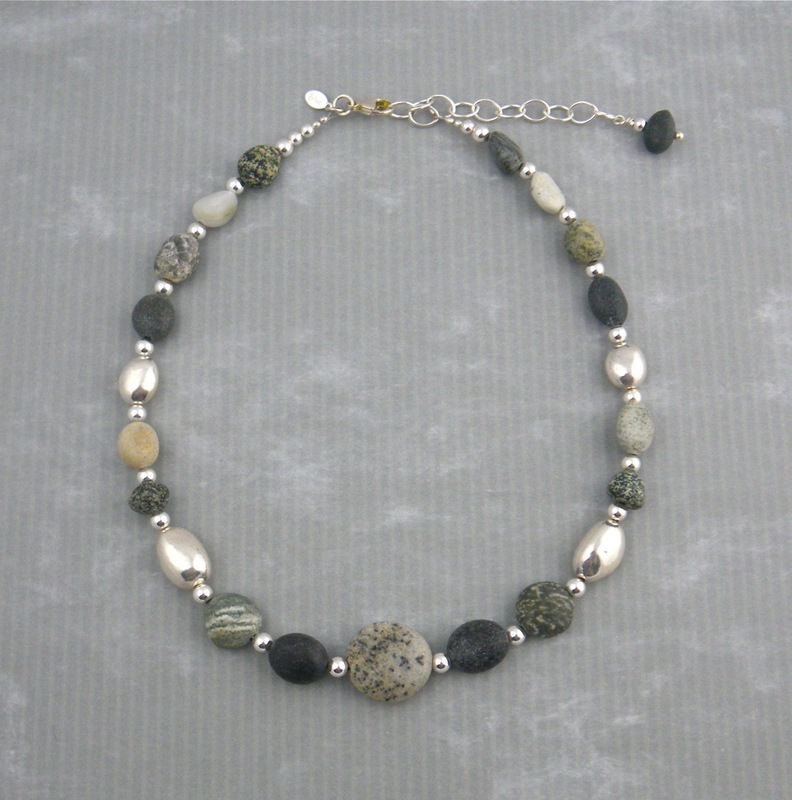 I still hope to get my Etsy shop up and running again…But more about those later. Time to capture the last of the afternoon light. I love the light in November. 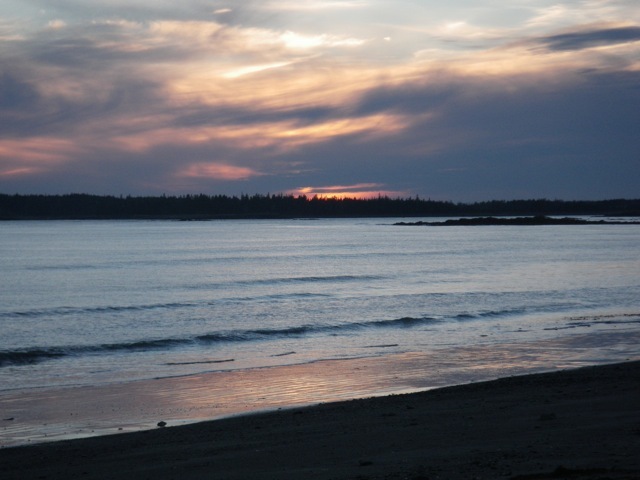 It starts to get dark pretty early on the coast of Maine, but you just can’t beat the angle of the light in the afternoon. 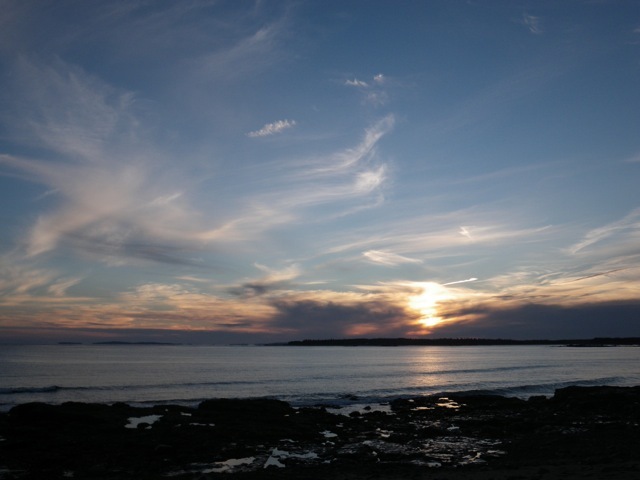 Today, when I took a walk to the old Coast Guard station, I was a little surprised to see the sun going down so soon. It was only 4 p.m. when I got home. Time enough to start dinner and go back to work in the studio!